Although sometimes it can feel like engaging in social media is akin to shouting into a bottomless pit and no one is really listening, you better be sure that if you claim to be part of a terrorist group planning “something” big and tweet that to a major airline, well, someone’s going to hear you. And maybe put you in jail. 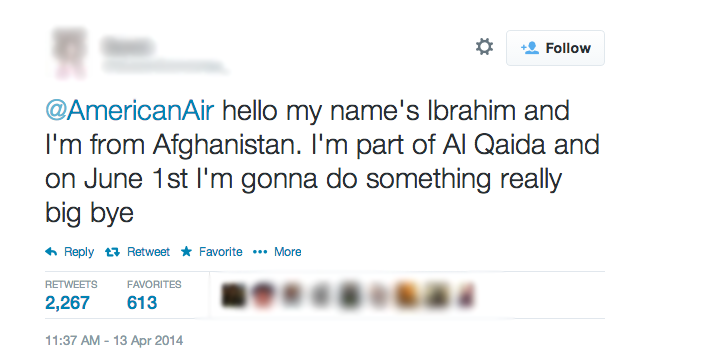 A Dutch teenager reportedly tweeted at American Airlines yesterday, saying her name was Ibrahim from Afghanistan, that she was a member of of Al Qaida and something “big” was going to go down June 1, reports Business Insider. 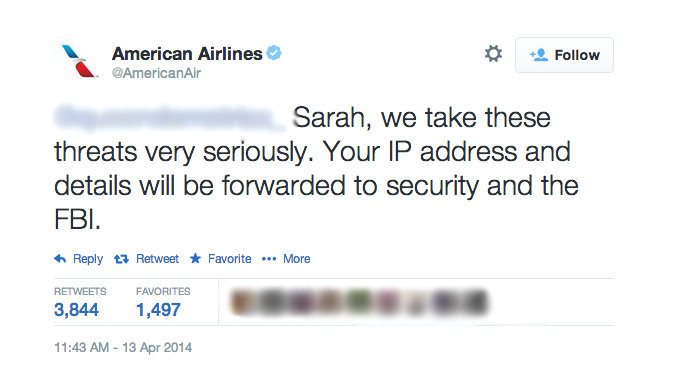 American Airlines took notice right away of the 14-year-old’s tweet and replied that this was no laughing matter. But Dutch police figured it’s better to be safe than sorry and have arrested her and have arrested her at her Rotterdam, Netherlands home. It’s safe to say her parents are now aware of what she’s been up to. We’re not in a state that we can communicate any state of charges at this point. We just thought it was necessary to bring this out mostly because of the fact that it caused a great deal of interest on the Internet. Will she most likely end up free soon enough, severely chastened and with a new respect for authority figures and the power of social media? Let’s hope so. Her account has since been deleted so she probably won’t be tweeting anytime soon, regardless. Previous Are You OK With A Restaurant Googling You If It Improves Customer Service?